Can you believe television used to require rabbit ears (antennas), often wrapped in tin foil, to get just the right signal? Maybe you remember standing with one foot in the air while your siblings did a slow interpretive dance around the television to get the signal to work? How times have changed. This morning when you sit down with your cup of coffee or cuddle up with your toddler and tune in to Rocky Mountain PBS, you may wonder, looking at your screen, what your support really means to us. I want to tell you, it means everything. Behind every piece of content we produce, air, and share: there you are. Your ideas, your interests, your passions, your family. It is YOU who that inspires us. 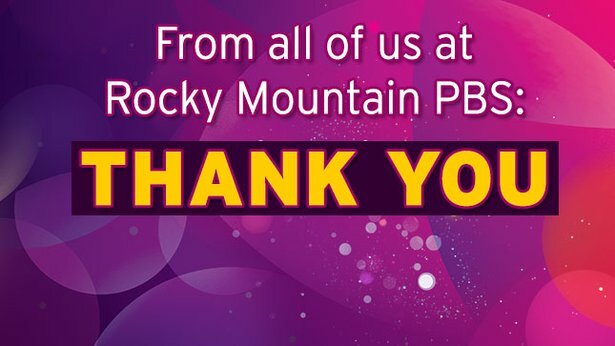 Thank you from all of us in the Rocky Mountain Public Broadcasting Network family: Rocky Mountain PBS, KUVO, and Rocky Mountain PBS I-News. Every day, we receive many notes of thanks from viewers and members. I wanted to share this one with you to show you how important your support is. This is what we are here for! Thank you for helping us serve our diverse communities as a convener of people, ideas and perspectives. Your investment in our work makes it all possible.